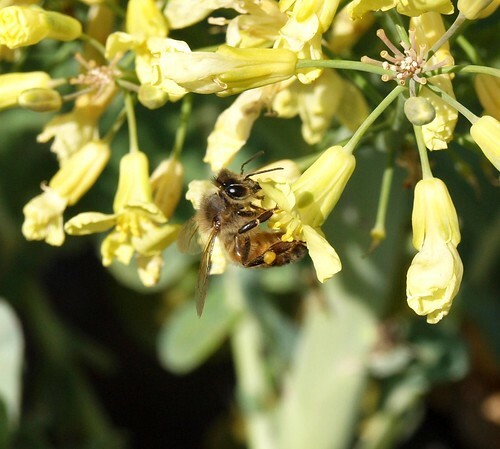 After our Austin Urban Beekeeping Meetup this past weekend, I’ve reserved the meeting room at the Terrazas Library Branch on Saturday, February 12th from 1:00 pm to 3:00 pm for additional time for Q&A. I’ll recap the basics for about 30-45 minutes, but I wanted to make sure we had plenty of time for questions.I’ll also hopefully have an answer from Dadant about free shipping for orders from our group as well. 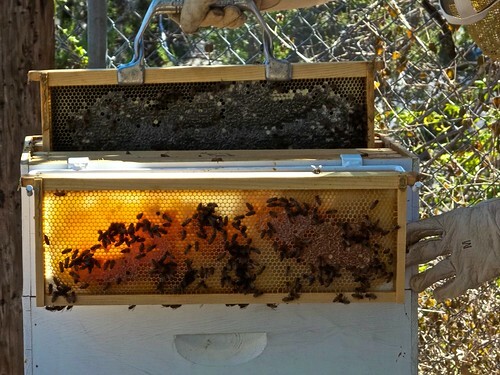 I performed a quick February inspection today to make sure the girls had plenty of honey to last them through the end of the month and into the start of the wildflower season in March. I made a batch of 1:1 sugar solution with a touch of Honey B Healthy just in case their stores were running low. When I removed 8 frames of honey on October 2nd, 2010, I was slightly worried I was taking too much, but as it turns out, my fears were unfounded. The top two supers were still full or even fuller with honey than when I last checked in December. Here I found evidence of some newly capped honey which is in the frame perch. I’m lifting a frame of older honey as a contrast. So as it stands now, Large Marge is living large with ample stores of sweet delicious honey. 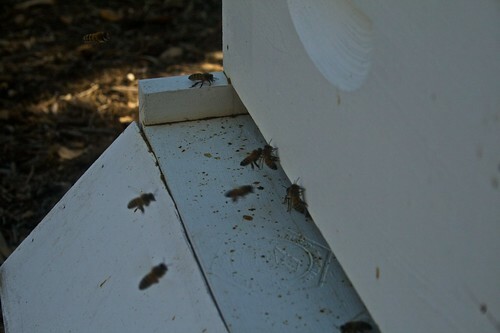 This will be great when I start the second hive in April as I will be able to loan some full frames of honey to the new hive to give them a kick start of food and drawn comb for egg laying. Large Marge eats freezing temperatures and snow for breakfast. After almost a week of record breaking cold temperatures in Austin, not to mention a few inches of snow, I was a little anxious on how Large Marge and the girls were holding up. Deep down inside, I know that bees are able to handle this quite well, and if cold weather killed bees off, no one in the northern parts of the U.S. could ever be beekeepers. Still, with the sun out today and much warmer weather, I did a quick check of the hive to make sure there was activity at the hive entrance. 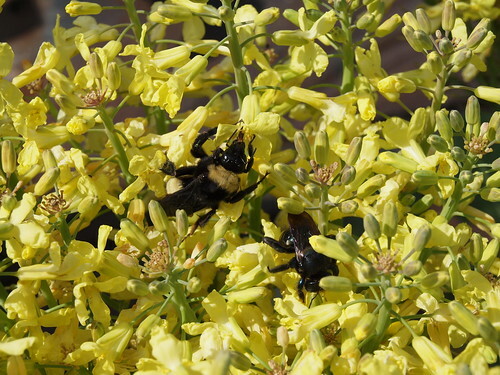 Sure enough, bees were coming and going. Tomorrow, I’m going to take a quick peek into the hive to make sure they still have adequate honey stores, and they are clustering well. If supplies look low, I’ll put the feeder back on to give them the food they need to make it through February.